Large disparities in HIV incidence and prevalence, and in the uptake of recent biomedical interventions to prevent HIV transmission exist across geographic areas whose populations differ in race/ethnicity, sexual orientation, health insurance coverage, income and education levels. Policy makers seek to allocate county resources across these areas to counteract disparities in both HIV incidence and in health outcomes for people living with HIV (PLWH). This convening will highlight work by researchers at UCLA and USC; Drs. 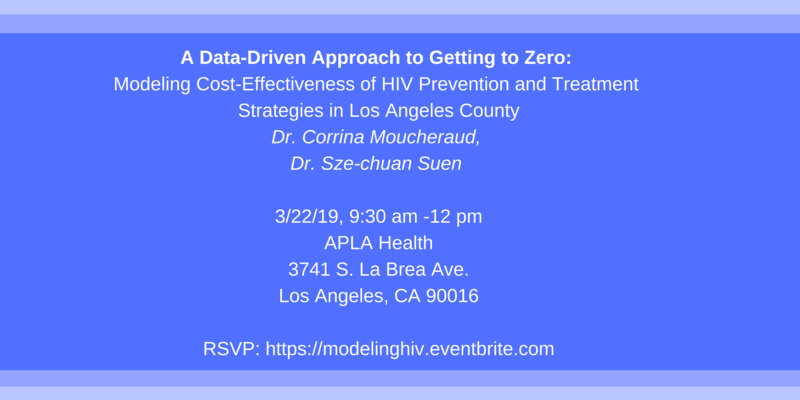 Suen and Moucheraud will provide preliminary results about interventions to reduce incidence by increasing coverage of PrEP in Los Angeles County, and will describe a data-driven approach to generate sub-county estimates of the cost and effectiveness of alternative HIV prevention and treatment interventions in each of the 26 subareas targeted by Los Angeles County Division of HIV and STD Programs. Discussion of stakeholder input for future iterations of the model will also be discussed. CHPRC will reimburse all travel for those attending from outside Los Angeles. If you have any questions, please contact Katja Nelson, Local Affairs Specialist at APLA Health, at knelson@apla.org or 213-201-1652. Thank you and we hope to see you there.